A curling stone is the perfect souvenir after a great time out on the ice! Only $38 exclusively at the rink. Join us at the Indoor Curling Rink for a fun day out with family and friends! If you’ve considered trying curling, but thought it looked too difficult, think again! Indoor Curling is a lot easier than you may think! Forget the professionals - Curling is for everyone! Bring your whole family and head down to the rink. 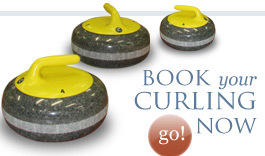 Our Indoor Curling Rink means you can visit us at any time of the year. Keep cool on a hot Central Otago summer day and head indoors to the only indoor rink in the Southern Hemisphere! After a great day out, check out the Pro-Shop. Our onsite shop features a great range of curling souvenirs and quality professional curling gear. The Indoor Curling Rink is open 10.00am to 5.30pm, 7 days a week (Winter) 9.00am-7.30pm (Summer). We can open early or stay late by arrangement and are open for evening curling most nights during summer for a perfect side trip to you Rail Trail Journey whether passing through or staying in Naseby, Wedderburn, Ranfurly or Waipiata. Please arrive 15 mins prior to your booking time. If you're visiting Naseby in the winter season and you’re after a faster-paced sport - take a walk up into the Naseby Forest, to the exciting Ice Luge! The Ice Luge is a first for the Southern Hemisphere and with 400m of track; you can reach speeds of up to 70kmph! The specially built track, next to our indoor centre, gives you the ability to go as fast or slow as you feel comfortable with. Ice Skating, Ice Hockey and Outdoor Curling are all also on offer in the winter season. These seasonal activities are great for groups! Book our indoor curling centre or other Alpine Park activities in Maniototo for a function or corporate event! Curling is the perfect activity for team building and getting to know each other. After your game, head upstairs to the Fully Licensed Lounge Bar/Viewing Gallery. This is a great venue for after game drinks, parties, fully catered meals and small meetings. Curling training and coaching is available for all levels of experience! Come and train with us and you could be New Zealand’s next International representative!